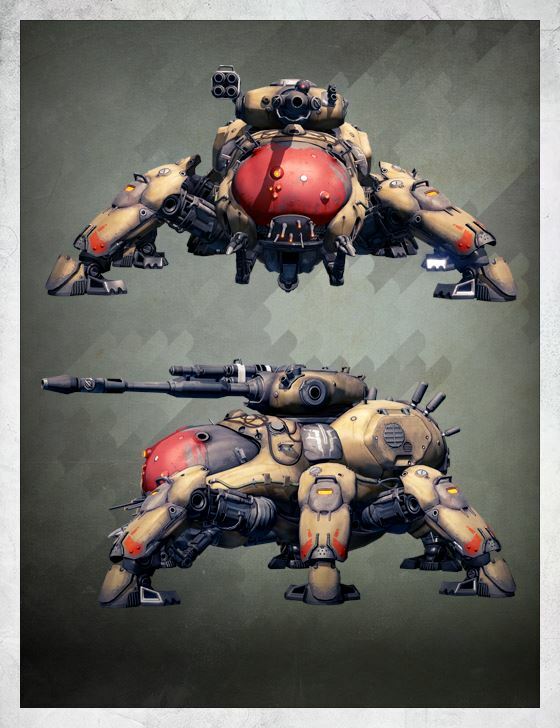 Fallen Walkers are mobile gun platforms deployed in offensive and defensive roles alike. Though their insect-like design gives them an eerie, almost lifelike quality, these heavily-armored monstrosities are purely robotic. Their advanced tracking systems can account for multiple targets as their forward repeaters and massive main gun sweep the battlefield for threats. Mine dispensers provide close defense against dismounted infantry, and an on-board Shank foundry produces armed repair drones. Walkers are immediate and deadly threats, having ended the Light of countless Guardians. The Fallen do not hesitate to deploy them to provide overwatch for their salvage and extraction crews. Walkers are also commonly used as blocking forces to guard key Fallen assets. At the Battle of Twilight Gap, Walkers engaged in a thunderous artillery duel with the City's gun positions. The collected wisdom of battle-hardened Guardians suggests Walkers can be beaten by focusing fire on the legs, overloading the Walker and rendering its armored core briefly vulnerable. When the Walker stumbles, Guardians should focus all available firepower on the exposed components beneath the neck plating. Some externally mounted weapons can also be disabled with precise fire.